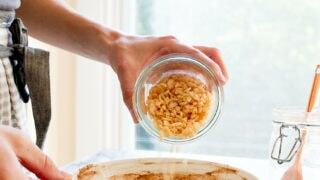 Pumpkin spice rice krispie treats for two. 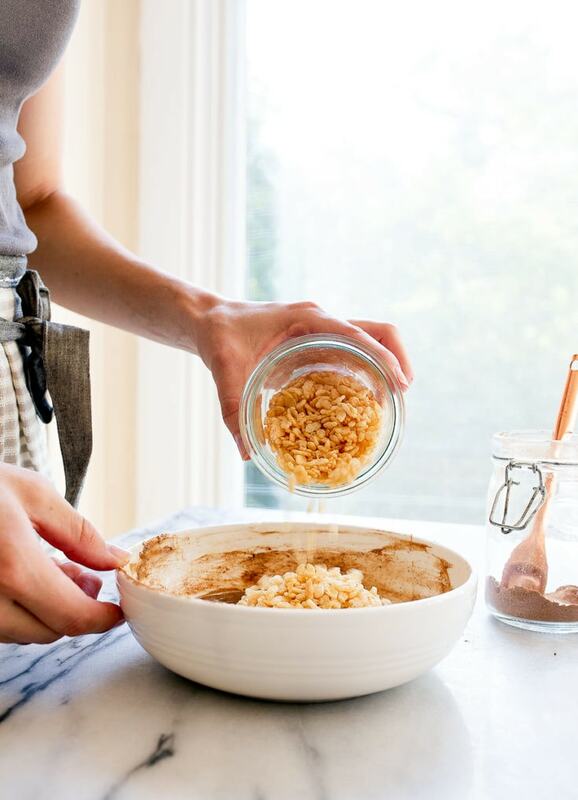 Imagine me, getting the idea to use my homemade pumpkin pie spice mix in a small batch of rice crispy treats, and then grabbing my keys and excitedly heading to the store to gather ingredients. I’m making my way to the baking aisle in the store, and right before I pick up a bag of mini marshmallows, I see it: pumpkin spice marshmallows. Whoosh. That was the wind leaving my sails. So they make pumpkin spice marshmallows now, did you know? They make pumpkin spice everything now, though, so my shock was limited to a brief second. I’ve seen pumpkin spice sausage links, pumpkin spice hand soap, and pumpkin spice gum. Why wouldn’t there be pumpkin spice marshmallows? And even I can admit…a pumpkin spice marshmallow sounds pretty dreamy. I wouldn’t say no to one floating on top of hot chocolate. I love a little spice in my chocolate; it reminds me of my favorite Mexican chocolate. But, as you can see, I pressed on with my original plans. I made my small batch of rice crispy treats in the microwave, and stirred in my pumpkin pie spice. I scraped every last bit of the sticky mixture out of the bowl and onto a sheet of parchment paper so I could mold it with my hands. I tasted a few sticky bits that gathered on the side of the bowl, and even though I didn’t buy a bag of pumpkin spice marshmallows for testing, I’m pretty sure I made the right choice. Homemade is best. 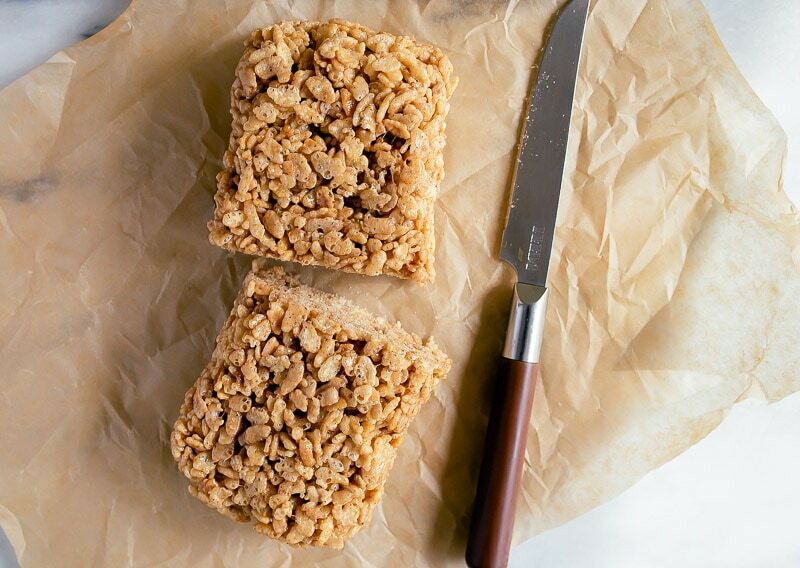 At the very least, the takeaway here is a small batch of rice crispy treats, that when cut down the middle, make two giant squares. I’ve also pressed a small batch of rice crispy treats into muffin cups, too. It’s up to you. The method with this version of the recipe is a bit easier because it’s all made in the microwave. Just a little heat, heat, and stir, stir, stir. And you can totally buy those pumpkin spice marshmallows if you want. They come in cute fall shapes, like leaves and acorns, and even I can admit that’s pretty dang adorable. 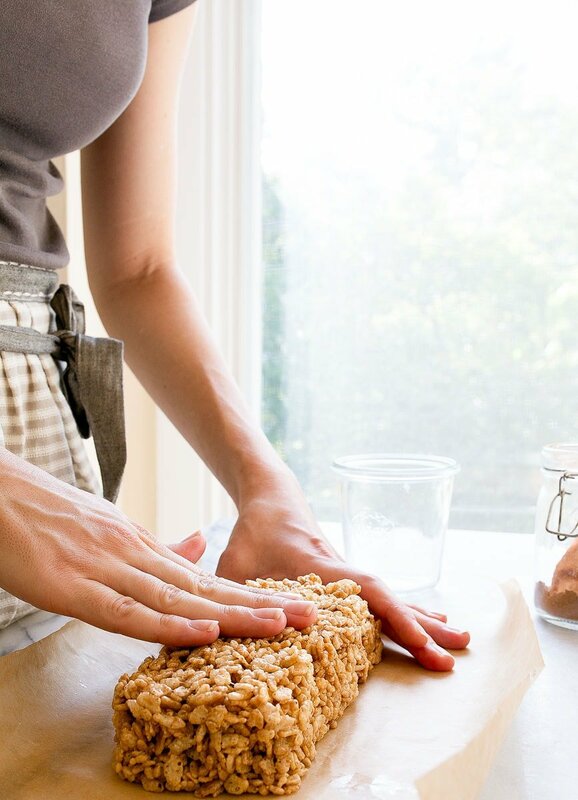 Pumpkin spice rice krispie treats are one of the first pumpkin recipes I make each year, because they don’t actually contain pumpkin, just pumpkin spice. It’s a great way to ease yourself into pumpkin season. 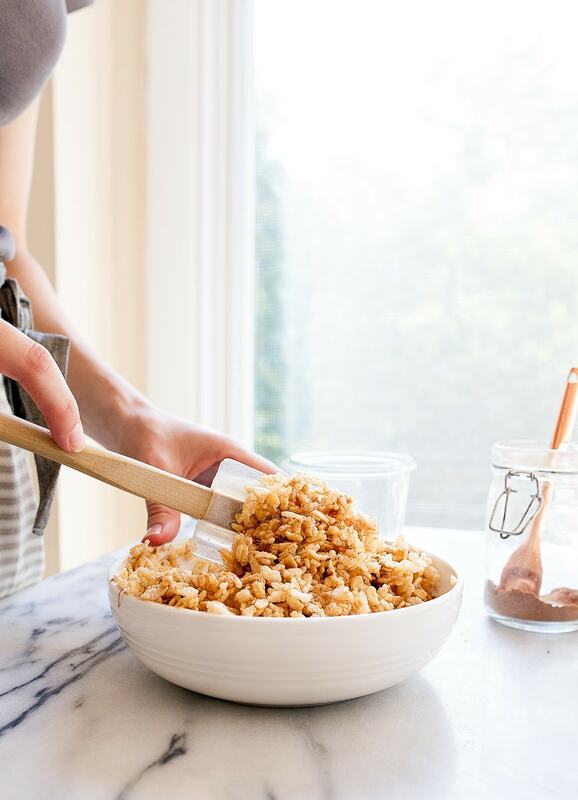 I hope you use these pumpkin spice rice krispie treats to ease yourself into Fall, too. Enjoy! you just made my dream come true!!!! Looks amazing! 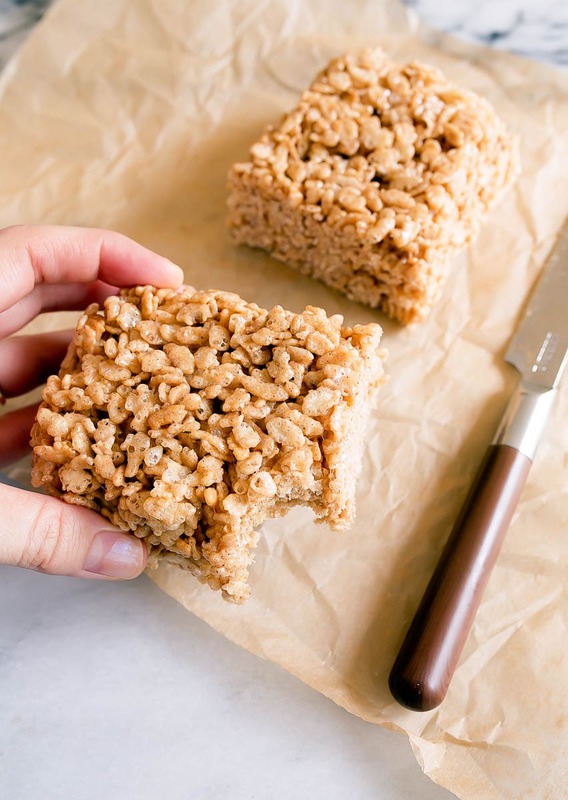 I tend to keep craving rice crispies but never wanted to make a full batch. I didn’t even think to make just enough for 2, even though I read your blog all the time. ???? Keep the fall recipes coming, please! Hey girl this sounds amazing! Yummy! Um yum, these sound delicious. Love how quick and easy they sound to make too! These are perfection – so deliciously “fall,” so super (SUPER) fast to make, and I used Earth Balance andvegan marshmallows to make them vegan!